We are social animals. We need each other to survive. When a new behaviour is adopted by a complicit group, it becomes ordinary. Through universal acceptance, anything can become ‘normal’. A few weeks ago, a nationwide series of events was organised as part of The Great Get Together to celebrate and honour the memory of Jo Cox. Her life, though taken so tragically, will live on through the lives of others who share her beliefs. She believed that we have more in common, than that which divides us. 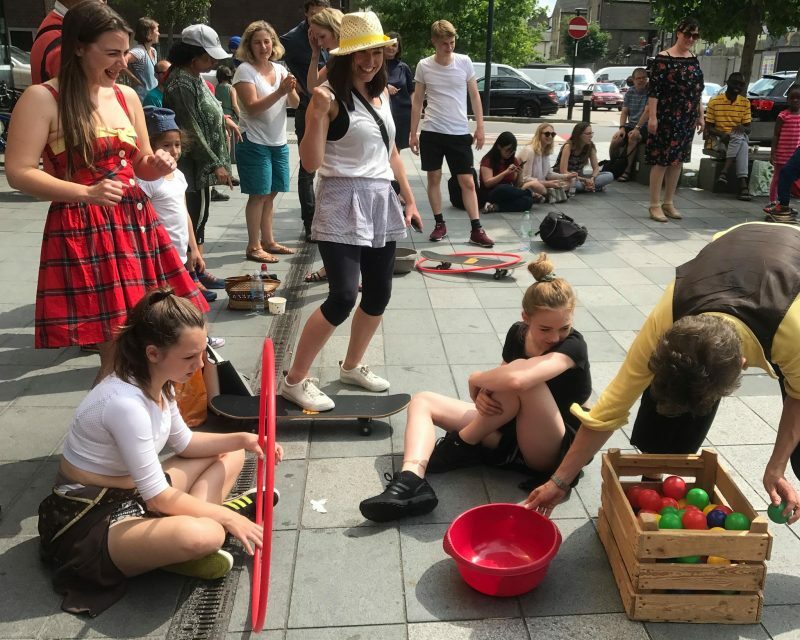 Antidote London is a company that offers playful sessions to adults as a means of escaping the seriousness of everyday life. These wonderful folks hosted a day-long event called The Playful Escape, as part of the Great Get Together, dedicated to play for adults. As Plato wrote, “you can discover more about a person in an hour of play than in a year of conversation”, so it was perfect for the occasion. 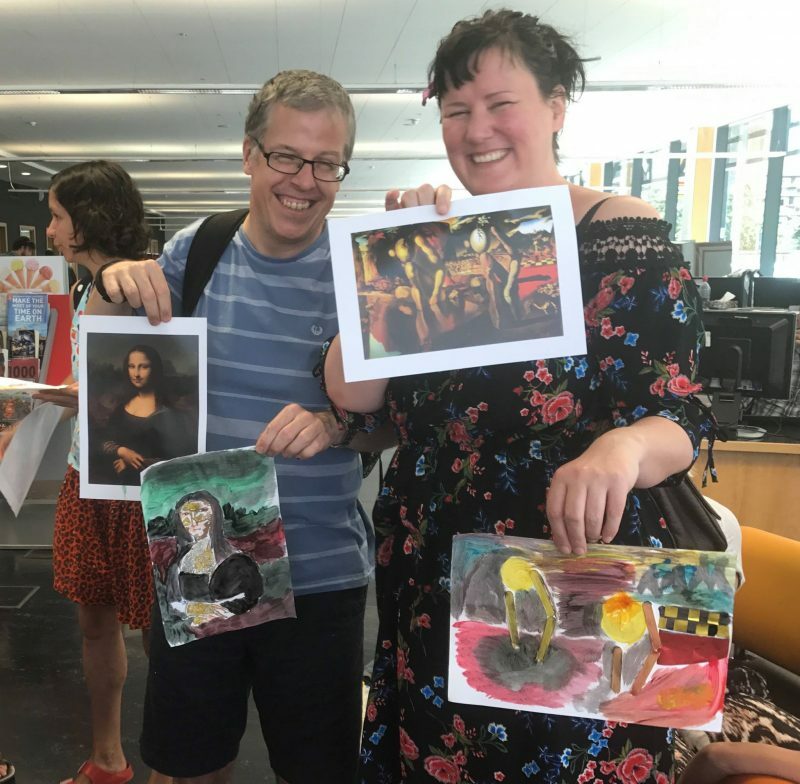 The day involved a plethora of different play activities, ranging from a drawing class, paper airplanes and a ukulele workshop, to clown games, a play memory bank and choral singing. Peachyface had a pop-up Play Gym on offer for people to explore in their own time throughout the day. Some of my personal highlights included a competitive game of musical chairs, and the joyful chaos of human hungry hungry hippos. 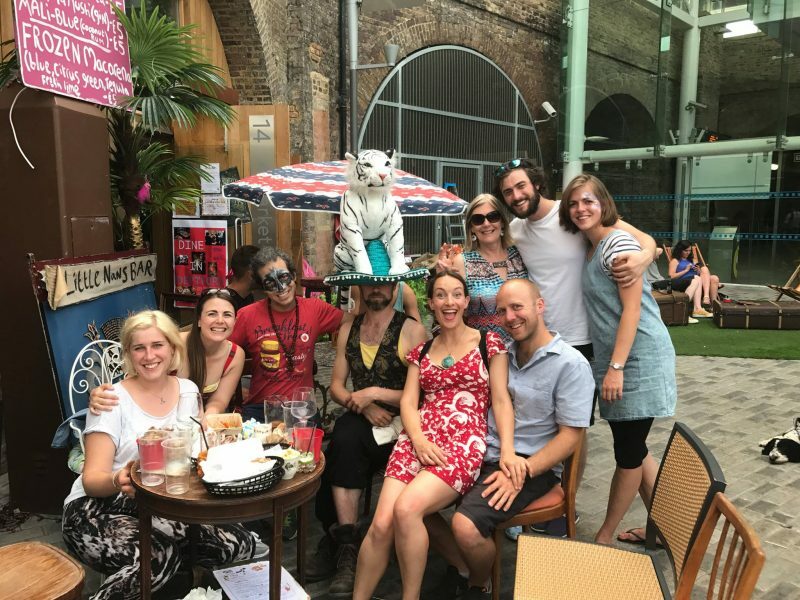 We had a wonderful group of people to play with – some old friends, some new friends and some very new friends that had been welcomed in from passing by in the street! Everyone there was open to play. What was magical about the day was this palpable sense of warmth, willingness and acceptance. We were all connected. One of the most insightful experiences of the day was Kevin Campbell Davidson’s Audioventure. This is a wonderful new project of his, so I heartily recommend you contact him if you’re interested in learning more! Each armed with a pair of silent disco headphones, we were sent on playful tasks, accompanied by an inspiring soundtrack. Our final adventure was to go on a ‘swim’. So off we took, like a parade of happy penguins, into the streets of Deptford. We ‘swam’ through the market, around flower stalls, knick-knacks and aromatic foods. Sending out apologies as we navigated the crowds; “I’m sorry madam, we’re swimming.” She laughed. It was glorious. We were completely safe in what Kevin called our ‘bubble’, protected by our group, and our headphones. Surprisingly, despite a few puzzled looks, you could see the locals delighted in our silliness. 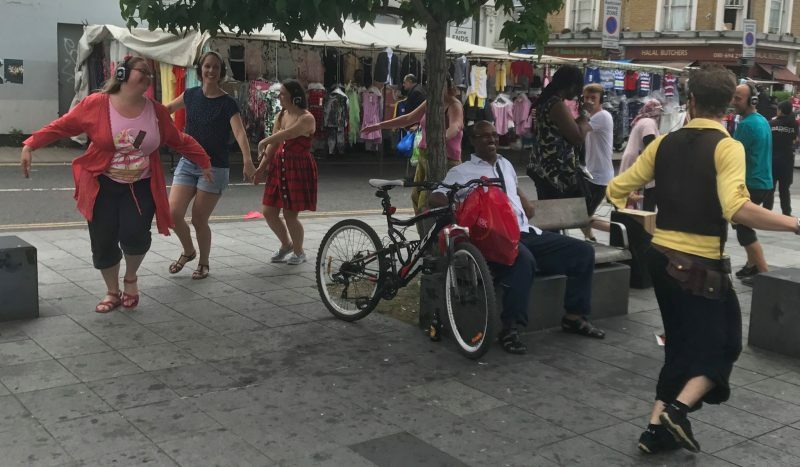 We were completely exposed and in the spotlight, yet it connected us to the community in a way that would never have happened as normal passers-by. We weren’t apprehensive, so neither were they. With a little encouragement, we even had a few people join us on our boogie walk back inside. We had recruits. The experience got me thinking about the variations of tribal behaviour. Our tribal ‘bubble’ had a membrane that was universally permeable – anyone could leave and anyone could join. While being part of a social group offers a lot of benefits, such as protection, support and a sense of belonging, there can be a darker side to it. This tends to happen when the bubble is selectively permeable. Most of us at some point will have encountered chanting football fans making their way home after a match. While the membrane here is permeable to other fans of the same team, it isn’t accessible (nor is it appealing) to everyone. This dominance behaviour is absolute; there’s no tolerance of variation or vulnerability. You’re either fully cooperating, or you’re making the other members look weaker. There is a risk of rejecting those who don’t ‘behave’ within the bubble, and a certainty of conflict with those from a rival tribe. If we are not careful, what we have in common with some, can divide us from others. In a playful tribe, behaviour is guided, not enforced. Everyone is treated as an individual part of the whole. There’s a healthy balance of direction and freedom. Play in and of itself is flexible. It’s not a solid form, but rather it moves and changes state, like water. Rules serve to shape the game; they ensure everyone participates equally, which maximises the fun. The rules of a game, however, are open to change and interpretation; they can always evolve. This encourages a spirit of collaboration and self-expression. Play is a universal language. It’s not exclusive. There’s no criteria to joining a playful tribe; the only conditions are to participate. On our Audioventure, the state of playfulness was the only thing that identified us as a tribe; our gender, race, style, age, beliefs, nationalities, were all diverse. It meant that anyone observing us, anyone inspired by our behaviour, could easily identify with us, and join in with our collective action. The Great Get Together created an inclusive tribe across the country. The Playful Escape created an inclusive tribe in Dalston. Here at Peachyface, we want to empower you to start your own playful tribes. The power of a playful tribe is that its membership can be universal. Let’s exercise that power. Together, we can enrich our lives with the power of play.